My nutritionist and I believe that inflammation in the body is the cause of all disease. So, how does one reduce inflammation in the body and prevent further inflammation from pervading the body? Following an anti-inflammatory diet is one way and in my opinion, the healthiest way. When I was diagnosed with Chronic Kidney disease, it was immediately following doing IVF where I injected myself with a number of drugs to stimulate the growth of my ovaries. My body went into overdrive and started attacking itself. I was put on the highest dose of prednisone a person can be put on to calm down my immune system. It worked, but only temporarily. I have since been put on another immunosuppressive drug called Tacrolimus. Of course I follow the direction of my Nephrologist, but I look at the drugs as more of a bandaid and not a cure. I believe that I can heal my body by ultimately getting control of the cause of the inflammation. The irony of being diagnosed with Chronic Kidney Disease is that I feel better than I ever have in my life and I owe that all to the diet. I have more energy than I ever have and I don’t get hit with crashes of fatigue in the middle of the day. My joints rarely hurt, I have less headaches and I am often told that I look better than I ever have (that’s always nice to hear). I no longer have food cravings, my skin looks better, and I am about 20 pounds lighter than I was in 2013 when I was diagnosed. Maintaining the diet is a commitment and can be difficult at times, so being organized with go-to recipes like the ones below is key! People tell me that they could NEVER follow the diet that I follow because they love bread and pasta way too much. I don’t think there is anyone on the planet who loves pasta and bread more than I do. In fact, when I was in Fifth Grade I wrote a short essay about my favorite food, Spaghetti. It’s been about 3 years since I have given up wheat and gluten and when I get tempted to stray, I remind myself that I will likely have a “gluten” belly ache for a few days. It feels like I have a brick in my stomach. I do not have celiac disease, but I can really notice how eating wheat affects me now since I follow a very clean diet. Plus, about an hour after eating wheat and gluten, I am EXHAUSTED because the sugar high that I have momentarily dips low and then all I want to do is take a nap. Wheat makes me feel so sluggish and that is reason enough to stay away from it. As much as I would love to dive into a warm loaf of bread straight out of the oven, an everything bagel with cream cheese or a bowl of my mamma’s spaghetti and meatballs, I tend to do well by sticking to my brown rice pastas and rice crackers when I need a carb fix. And I have come up with some great alternatives. This recipe I tested on my entire family and they LOVED it! They actually did not realize that they were eating turkey until I told them. Bring water to a boil for pasta. I recommend cooking the brown rice pasta about 1-2 minutes less than the recommended time for the Tinkyada Pasta (so, 12-13 minutes for the fussilli and 14-15 minutes for the spaghetti) and the minimal amount of time, 7 minutes, for the Trader Joe’s fussilli or spaghetti. Mix raw turkey, garlic, onion, olive oil, basil, oregano, salt and pepper in a large mixing bowl. I find it easiest to just use my hands to mix everything together. Add about (add less or more as you wish) 1 cup of cooked rice and mix together. 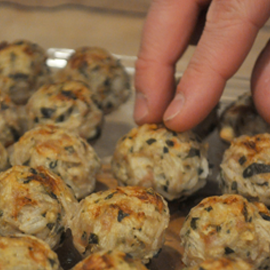 Form into small-medium sized balls and place on a lightly oiled cookie sheet. Cook for 20 minutes and then rotate. 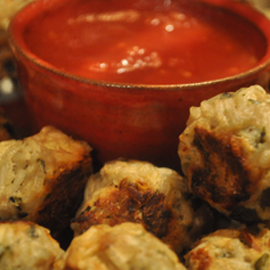 Cook for 20 minutes more or until meatballs reach 160 degrees using a thermometer. 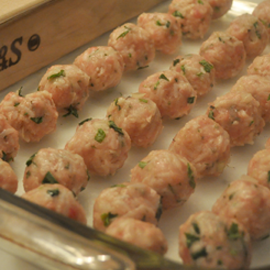 Because we are using poultry, it is important not to OVERCOOK the meatballs or they will become dry. If you are adding this to a sauce, there is no need to cook them in the oven! Just add them to a tomato based sauce and cook for at least 40-minutes. The longer, the better to give the sauce flavor, but be wary of overcooking. I would be lying if I said that I measured out all of the ingredients every time I made these. Most of the time, I just eye the olive oil, shake in a bunch of spices, and throw in a few handfuls of the rice. They always come out delicious, whether as a traditional Spaghetti and Meatballs or as an appetizer with dipping sauces on the side. 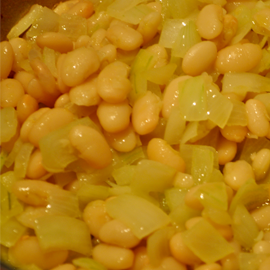 Fasolatha: A simple, classic, greek vegan dish! Since becoming a mamma my time is very limited and I find that I only have about 20 minutes to get any meals prepared before my attention gets diverted to Garrison. This is a family recipe is a favorite, one that my mom introduced me to and that I have since shared with many friends. My husband LOVES it and it is perfect to help you stay warm during the cold winter months. It is even better the next day! Dice onion and saute in olive oil until brown (the original recipe calls for about half a cup but I always cut the oil and it turns out just as tasty). Add beans and tomato sauce and cook over medium flame until the sauce thickens and the beans soften, about 25-30 minutes (I always prefer to use dry beans, soaking them overnight or doing a fast soak, and fresh tomatoes, but in a pinch you can make this with canned beans and tomato sauce). Using a medium flame can cause the beans to stick to the bottom of the pan but as my mom says, "This will add flavor to the meal". Remove from heat and sprinkle with fresh parsley. Serve with bread or brown rice crackers and feta cheese if desired. This recipe for oatmeal reduces inflammation, that's why I called it Super Oatmeal. Nothing about oatmeal has ever seemed appealing to me. Like, at all. It always seemed bland in color and taste and just all around boring. That was, until I started to jazz it up to make sure my son was getting some essential vitamins and minerals. Bring 1 cup of water to a boil. Add Half-cup of oats (or oatmeal of your choice)-this yields more than enough for myself and my 16 month old. Reduce the heat and cook for up to 10 minutes. Although the directions on the package say 10-20 minutes, I never find that it takes longer than 10 minutes cooking time. If using cacao, cook them as well, so they can soften. If out of season, I add frozen berries after about 5 minutes of cooking. Remove from heat and add cinnamon, almond butter and ground flax seed (it is important that the flax in ground to maximize absorption) and fresh berries. Stir the flax, berries and almond butter into the mix until the oatmeal is well blended. I personally like the berries whole but I mix everything well for my son, otherwise he will likely pick out what he likes best. Enjoy while it is still nice and warm!